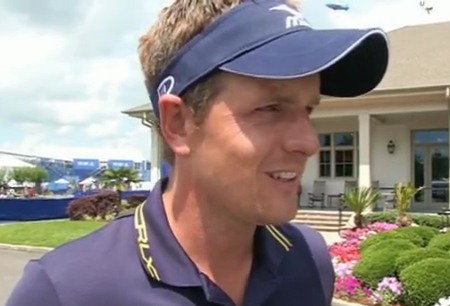 The 34-year old Englishman needed to finish solo seventh or better at TPC Louisiana to go back to the top of the rankings just two weeks after losing his crown to McIlroy. An opening 73 left the Chicago resident facing a huge task but he closed with rounds of 65, 66 and 67 to finish on 17 under. That left him just two strokes outside a play-off for the title that saw Jason Dufner (70) beat Ernie Els (67) with a birdie four on their second visit to the 18th to win his first PGA Tour title at the 164th attempt. The world No 1 ranking has now changed hands seven times since Lee Westwood ended Tiger Woods’ record setting 281-week run (five years, four months and 19 days) in October 2011. Westwood remained at the top for 17 weeks but then lost the top ranking to Germany’s Martin Kaymer for two months before returning to the top for another five weeks. The Worksop native lost top spot when Donald beat him in a play-off for the BMW PGA Championship title at Wentworth last May. Donald subsequently went on to hold the top ranking for 40 weeks before McIlroy became Irish golf’s first world No 1 following his victory in the Honda Classic in Palm Beach Gardens on March 3. The Northern Ireland native stayed at No 1 for two weeks but was deposed on St Patrick’s Day (March 17) when Donald won the Transitions Championship after a play-off with Americans Jim Furyk and Robert Garrigus and the Korean Bae Sang-moon. Donald held top spot for four weeks through the Masters Tournament but lost it again when he could only finish 37th in the RBC Heritage at Hilton Head Island two weeks ago and an absentee McIlroy went back to No 1. The Englishman is skipping this week’s Wells Fargo Championship at Quail Hollow which means that McIlroy, who will celebrate his 23rd birthday on Wednesday, can go back to No 1 with a good performance at a venue where he clinched his maiden PGA Tour win two years ago with a closing 62. As for the Zurich Classic, it was a disappointing week for Graeme McDowell who finished 14 shots outside the play-off in a tie for 57th on five under after rounds of 69, 73, 69 and 72. Dufner began the two-stroke lead over Canadian Graham DeLaet but saw Els, who started three of the pace, surge into the lead on 18 under when he followed early birdies at the second and fifth with an sublime eagle three at the seventh. The American followed five opening pars with a bogey at the sixth before birdies at the seventh eighth and 10th allowed him to draw level with Els, who birdied the par-five 11th. Struggling with his putting in recent year, Els then holed crucial par putts from 10 feet at the 12th and 14th and 14 feet at the 17th to remain tied for the lead. Dufner came close to disaster when he drove into water at the 16th but after penalty drop, he found the green in three and drained an unlikely 44 footer for his par to keep his hopes alive. Els then bunkered his four-iron approach in the trap short of the par-five 18th and failed to hole a 17 footer for birdie, posting a 67 to set the clubhouse target at 19 under par. Dufner, who was beaten in a play-off for the US PGA Championship by Keegan Bradley at Atlanta Athletic Club last August, needed a birdie at the 18th to win for the first time on tour. But he was forced to lay up after his drive left him an awkward stance close to the fairway trap on the left and then failed to get up and down from 35 yards, pushing an 11-footer for the win wide of the hole. Returning to the 18th in sudden death, both men missed from inside eight feet for birdie. Els bunkered his approach while Dufner left himself a 66 footer for eagle but three-putted. On their second visit to the 589 yard 18th, Dufner hit the fairway and again found the left hand side of the green as Els bunkered his tee-shot and was forced to lay up. The 42-year old South African finished just off the green with his approach but Dufner made no mistake the second time around and knocked his 40 footer 12 inches past the cup and then looked on as Els failed to make his 18 foot birdie attempt from the fringe. Els will get a chance to make amends for his close call at Quail Hollow but Dufner has other plans - he’s getting married to his fiancée Amanda later this week. 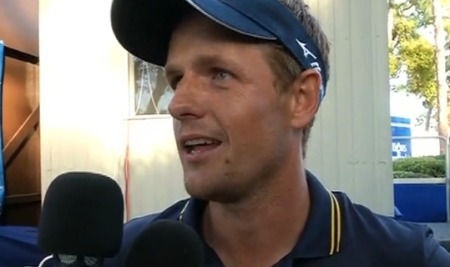 Luke Donald denied Graeme McDowell the world No 3 ranking and shook a monkey off his back when he beat newly-minted No 1 Martin Kaymer 3 and 2 in the final of the $8.5m WGC-Accenture Math Play Championship. Rory McIlroy is the new world No 2. With permission from Luke Donald, Lee Westwood and Martin Kaymer, it appears to be only a matter of time before he is No 1. Picture www.golffile.ieRory McIlroy created another piece of golfing history in far-flung China on Sunday when he finished fourth in the WGC-HSBC Champions to leapfrog Lee Westwood and become the first Irishman to reach No 2 in the Official World Golf Ranking.